Avid followers of the campaign to Save The Elms will no doubt remember that back in February this year (2018) Rectory had their 2nd application for a care home with 85 houses on it REFUSED by SODC planning department, but now they've come back for another crack at the prize and it ain't much different! Further to the recently withdrawn application for 87 care homes, Rectory's "Application of the Week" is now for 85 care homes - the 3rd major application for this site in less than 3 years. Full details of the application can be found on SODC's website here. The brief overview of the application is for 85 care homes which includes onsite nurses, catering and entertainment facilities for the over-65s. As recently announced on elmspetition.org.uk, Rectory Homes have now applied for planning permission for 87 care homes on The Elms. Full details of the application can be found on SODC's website here. The brief overview of the application is for 87 care homes which includes onsite nurses, catering and entertainment facilities for the over-65s. It has recently been confirmed by numerous sources including Thame Town Council*, that Rectory Homes, developers of The Elms in Thame are in 'pre planning' discussions to amend their previously approved plans to develop The Elms from 37 houses to around 85 retirement flats. Needless to say, this ammendment will be entirely in contradiction to the Thame Neighbourhood Plan which allows for the development of 'up to 45 homes' on The Elms. Whilst the plans have yet to be revealed, it is no doubt the sole basis for the argument will be that the 85 flats occupy the same footprint as the 37 homes that gained inexplicable approval back in July 2015 despite huge opposition from residents, councillors and professionals employed by South Oxfordshire District Council alike. With the recent revelation that The Royal Town Planning Institute (RTPI) has found Mr Jake Collinge in breach of their code of conduct in relation to his work on the Thame Neighbourhood Plan, we write to request that you formally review the Neighbourhood Plan and specifically propose a motion to remove The Elms from it. It is public knowledge that Mr Collinge undertook a substantial amount of work on the Neighbourhood Plan despite his ex-employer, on-going major client and landlord Rectory Homes being owner of one of the sites allocated for housing, The Elms. Although you and your council have always insisted he had no input when it came to The Elms, the RTPI have clearly found this claim to be incorrect. Evidence provided to the RTPI in relation to this investigation includes details about the meeting between Thame Resident Peter Webb, the Town Clerk Helen Stewart and Mr Collinge. Whilst Mr Collinge, you, your council and the Town Clerk have always maintained this meeting did not relate to The Elms, Mr Webb has been entirely vindicated with the verdict. Mr Webb has always maintained the sole purpose of the meeting was to discuss The Elms and Mr Collinge clearly participated in it, we request that you acknowledge this in its entirety and rectify the untruths spoken about the content of this meeting, in particular by Ms Stewart, the Town Clerk who has corroborated this false statement. The fact that Mr Collinge was even remotely connected to the construction of a plan which paved the way for his ex-employer and on-going client, Rectory Homes, to receive what is tantamount to a windfall by including a substantial piece of conservation area in approved areas for housing development is deplorable. What is even worse though, is that your council and Rectory Homes have issued legal threats to residents of Thame who have dared to raise this issue in public. To these people, we request that you make a full and unreserved public apology for your part in this. Furthermore, we have analysed the recent financial payments as released on the Town Council website and noted that Mr Collinge was paid at least £12,000 in Q4 of 2014 for his work on the Thame Neighbourhood Plan. We request that a full disclosure of the amount paid to Mr Collinge for his entire work on the Plan is made and request that you do everything in your powers to recoup much of the money paid out based on the fact that his work has been proven not to be impartial. When you analyse the ruling of the RTPI declaring Mr Collinge in breach of his professional code, along with other factors including the withholding from the public and councillors the letter from English Heritage which described any development as "deeply damaging" we are sure that you cannot continue to have confidence in the inclusion of The Elms in the Plan. Whilst we do not suggest the Plan should be entirely scrapped, the area of concern is clearly The Elms. With recent amendments to the planning application for development on The Elms a minimum of 8 houses already have to be reallocated as per the provision in the Plan. We request that you reallocate all 45 houses across other suitable sites and remove The Elms from the Plan with immediate effect. We look forward to your immediate action on this issue. The 2100 members of The Elms Petition Group. 13th Aug: Breaking News: English Heritage reinforces their opposition to planning application for 45 houses on The Elms. Read the full story here. 4th Aug: Breaking News: Sick Joke Planning Application submitted for 45 Houses on The Elms hides a Dark Secret Strategy. Read the full story here. 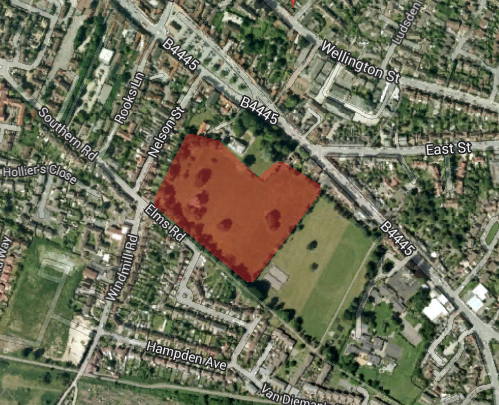 Breaking News: Planning Application submitted by Rectory Homes to modify Elms Park to their benefit. Read the full story here. 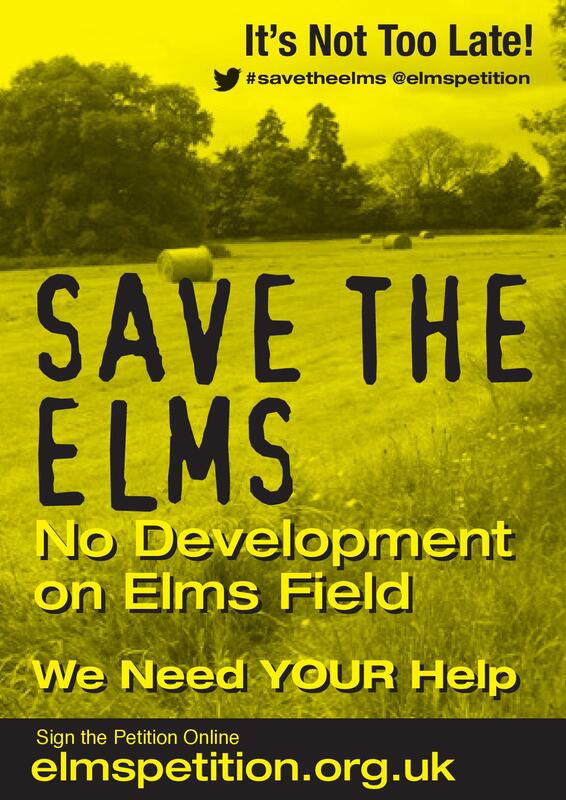 Elms Field in Thame is currently under the threat of development by the owners of the Grade II listed house, The Elms. Developers Rectory Homes intend to apply for a development of up to 45 new homes on this ancient field in the centre of the Historic Oxfordshire market town of Thame. Elms Field was quietly slipped into the Thame Neighbourhood Development Plan under questionable circumstances. Many residents feel this is an unnecessary location to fulfill required housing quotas when these could easily be accomodated in other, more sustainable development locations around Thame. Town Plan Can Be Changed! This is a conservation area which, by its vary nature, restricts development to maintain character and history. South Oxon District Council describes The Elms and Elms Park as 'Important open space' specifically to stop development on the areas. The ecology of the parkland and surrounding areas will be negatively affected by this development. Sufficient land is available in more sustainable locations around Thame which will be developed anyway. Increased traffic to the only access in Elms Road will cause traffic and congestion problems. Thame Town Council refused development of 7 houses nearby due to added congestion problems - this is a development of many more houses than that! These new houses will put major pressure on key utilities such as sewerage which may need upgrading at significant disruption.